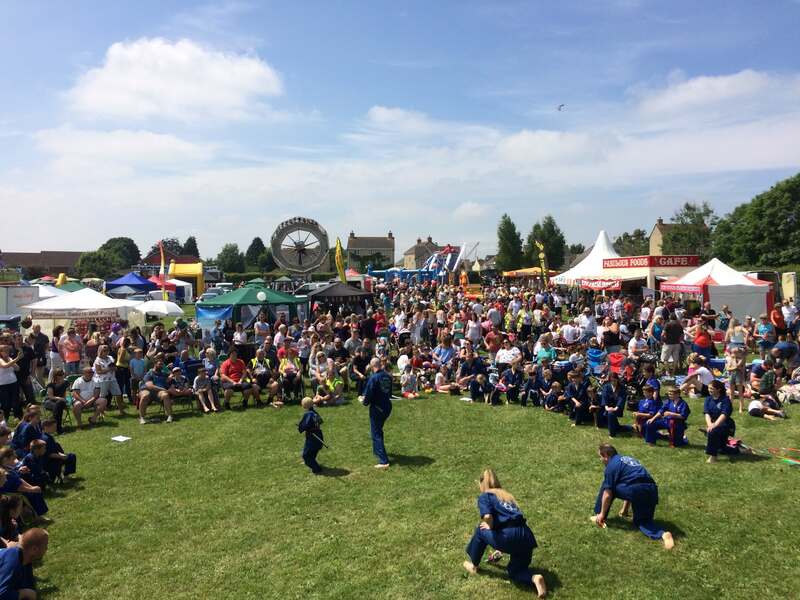 Almost 3,000 villagers came along to Peasedown St John’s 10th Annual Party in the Park Community Festival last Saturday to celebrate the joys of summertime. Sponsored by St John’s Church, Care South, Bath Audi, Curo Housing and Peasedown St John Parish Council, crowds enjoyed seven hours of live music and entertainment. The Official Event Partner was the Somer Valley Foodbank. The event, which included a special flag-raising ceremony with festival organisers and Cllr Sarah Bevan and the cutting of a 10th Birthday Cake, featured a huge array of stalls and attractions, such as the village’s second Official Push Kart Race, the return of the Peasedown Diamond cider, Peasedown’s first Dog Show, and the results of the Party in the Park Grant Giveaway. ago. The leadership role she has taken on at the church has helped support the regular lunch clubs, breakfast get-togethers, drug support groups, Foodbank collections and pre-school groups for local children. Over £3,000 was raised on the day, which contributes to the total £7,000 cost of hosting the one-day event. All of the money will be reinvested back into Peasedown St John either through future events or the Party in the Park Grant Fund. Festival revellers were kept entertained all afternoon thanks to back-to-back outstanding performances from DJ Pete Bailey, Bath Spa Band, Call the Shots, Pub Rock UK, Jamie Woodland’s Black Belt Academy, Boogie Bounce, Up Your Brass, Susan Hill School of Dance and Bath All Starz. To add extra excitement to the proceedings, this year’s Special Guest Hosts were Pete and Seb from Somer Valley FM, with the radio station broadcasting live throughout the afternoon. A massive £2,500 was given away this year to organisations that are either based in, or work in, Peasedown St John. Peasedown St John Methodist Church, Wansdyke Play Association, Peasedown Wellbeing Group, Peasedown St John Primary School, Peasedown Albion FC and Peasedown Youth Centre were all presented with grants. Other attractions and stalls throughout the afternoon included; Rose’s Yummie Licious Cakes; BBQ; Disney Pops Delight; Juicey Orange Coffee Shop; Coffee and Donuts; Prosecco Bar; Gin Bar; The Red Post Beer Tent; Ice Cream; SpudStation; Candy Floss; Animal Welfare Birds of Prey and Reptiles; Annie & Grace Dog; Boutique and Accessories; The Pupcake Princess Dog Bakery; Crafty Hounds and Forever; Hounds Trust; Hair Braids and Facepainting; R & R; Melts Candles; Bath Theatrical; Costume Hire; Plants; Utility Warehouse; Dicorato Jewellery; Snap Fitness 24-7; Camerton and Peasedown Croquet Club; Rollercoaster Ride; Mega Slide; Bungee Trampoline; Inflatable Bumper Cars; Teacups; Jumping Jo’s; Under The Sea Inflatable; Swings; Great Western Air Ambulance; Avon Fire and Rescue; Avon Wildlife Trust; Peasedown Social and Well-Being Group; Thornbury Hospital League of Friends; Air Cadets; Reversing For Cancer Tipper Truck with ‘Send a balloon’; St J’s Little Ones and a classic Bedford RL 1957. Peasedown St John’s 10th Party in the Park festival was held on Saturday 9th June on Beacon Field, from 12noon – 7pm. Thanks to the support of the Somer Valley Foodbank volunteers, Air Cadets and Party in the Park volunteers, over 60 hours of time were given to staff the festival gates, and ensure the event ran according to plan, and to schedule.